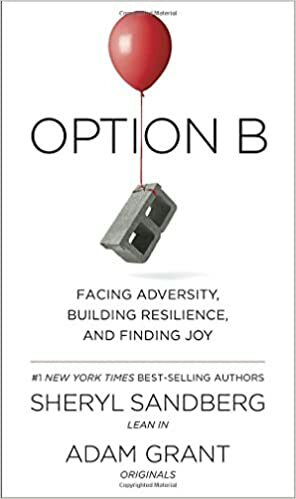 I just finished the reading the book "Option B" by Sheryl Sandberg (COO of Facebook) and Adam Grant (Prof. in Wharton Business School). After the sudden death of her husband, Facebook COO (and author of Lean In) Sandberg finds herself a widow and single mother. It is a brave attempt to unveil the vulnerability with such rawness and honesty.Her book isn't exactly a checklist--which I think is a good thing--but it is a way to take charge of one's own response to tragedy or difficulty. Sandberg researches what these things are, and does her best to follow them. Turns out these types of mindsets or mental exercises are good for all of us who have gone through something as tragic or even mildly difficult. And they are good for those of us who have stood by friends who have lost loved ones or are battling enormous life adjustments. Or smaller challenges, too. Or maybe we're parents of children whose lives will inevitably involve some hardship, and we'd like to teach them to be resilient from a young age. - The "3 Ps" can stunt recovery: 1) Personalization, or the belief that we are at fault; 2) Pervasiveness, or the belief that an event will affect all areas of our life; 3) Permanence, or the belief that the aftershocks of the event will last forever. Challenging those responses and letting rational thinking return to the forefront helps. - It's no big secret that learning from mistakes is helpful in school and at jobs. I liked the story of Kim Malone Scott at Google who brought a stuffed monkey named Whoops to team meetings. The person who had the biggest screw up got to have Whoops sit at their desk for the week. - I loved the idea of opening yourself in a humble way to feedback. Sue Ashford's studies "show that although fishing for compliments hurts your reputation, asking for criticism signals you care about improving." - "Believing it will all work out helps it all work out." - Loved the last chapter of adding humor back into life after a tragic event or loss. "Humor lowers our heart rate and relaxes our muscles. Humor is a signal that a situation is safe. Laughter breaks tension by making stressful situations less threatening." I strongly recommend this book. I am in complete admiration of Sheryl Sandberg and her determination to move forward in a positive way for the sake of her children, family, friends and colleagues and am thankful that she generously decided to share her nightmare with those of us who can always use a little advice of what to do when someone we love meets tragedy. Goldsmith has worked with Alan Mulally and finds that “no idea looms bigger in Alan’s mind than the importance of structure in turning around and organization and its people.” Goldsmith explains how Mulally integrated the Daily Questions process in his weekly Business Plan Review meetings with his sixteen top executives. And repetition was key. “In the same way that Daily Questions drive us to measure our effort every day and then face the reality of our own behavior, the executives would be announcing how they graded themselves every Thursday—without deviation.” And in the group setting the idea was: How can we help one another more? Deletion isn’t something that we are always aware of but we should anticipate it and create structure where we can. “If we provide ourselves with enough structure, we don’t need discipline. The structure provides it for us. We can’t structure everything obviously—no environment is thatcooperative.” But the more structure we have the less we have to worry about. Nuggets from the book "Presence"
Just finished reading the book "Presence" by Amy Cuddy. Practically written upon the base of sound academic research and knowledge, Cuddy manages to clearly and succinctly lead the reader into the world of "Presence"; so much so that it is becoming an entity in its own right. Presence is about harnessing confidence and poise. How do you carry yourself? How does that make you feel? How do you think others see you? The first few chapters are all about harnessing this presence and believing your own story. This is one of many profound insights Cuddy presents about how we can use our physiology (our bodies) to increase our power and presence. There seems to be what researchers refer to as a “bidirectional” relationship between feeling and behavior: when you feel powerful, you expand your body, and when you expand your body, you feel powerful. Bottom line: Expanding your body language, or carrying yourself in a more expansive way can actually make you feel more powerful. Go to your local coffee shop on a busy day, and you’ll probably find 80% of people hunched over their tiny little smart phone screen. Regardless of whether they do it while they’re sitting or standing, this hunching-over-screen habit is NOT contributing to their sense of presence. In fact, it’s impairing their ability to expand, thus contributing to powerlessness. It’s actually quite obvious when we think about it: hunching down at a smart phone screen produces an inward stance; when what we’re really looking for is an expansive stance. If you’re looking to cultivate more presence, power, and a sense of genuinely connected with other people, then stop hunching over and tapping away at your smart phone all day long. And start being more present by putting away the smart phone, straightening out your posture, and expanding your stance a little more often. The tips, studies and facts around positive poses and presence really resonated with me. If you really liked what you read so far, you should get the book. Tony Dungy mentions in Quiet Strength : "It is the journey that matters. Learning is most important than the test. Practice well and the games will take care of themselves." Rick Pitino in Success is a choice: Individuals with great self-esteem will do great things..they're the ones others count on to boost results when the company needs it most. I am currently reading the book "Playing it my way" written by the Cricket Legend Sachin Tendulkar (SRT). I always want to know what he had to go through to reach the pinnacle of success he had achieved to be one of the greatest cricketers of all time. One of the stories which he shares in this book really shows what he is made up of. SRT's career did not start the way one would expect. When he started getting coached from Ramakant Achrekar (RA), he moved schools to Sharadashram where RA coached. The first two games he played, he scored two consecutive ducks. He scored 24 runs in the third game. One had to score at least 30 runs to get the individual score published in newspaper. The scorer of the game mentioned to SRT that he will make up his score to 30 (adding the extras of 6 to his score) and convinced SRT that it should be alright as he is not changing the total. In the excitement of seeing the name in the newspaper, SRT had agreed to fudge his score from 24 to 30. He was hoping he would get applause all over the place for this accomplishment. Instead, the following day SRT got the surprise/shock of his lifetime. Coach RA got really upset, shocked and unhappy after seeing the fudged score in the newspaper. He took SRT aside and showed through the motion how unhappy he was with the manipulation. It taught him a valuable lesson of integrity and SRT promised that he will never do that again. What a powerful story and a powerful lesson! The instance clearly shows how his character is made up of. I have seen lot of occasions where emphasis is given more on performance than integrity. So I have seen lot of people falter and fudge having the notion of doing whatever it takes to make things happen. Doing whatever it takes is good but it has to be done with integrity. Success without integrity is not long lasting. Even though he might erred in this occasion, it takes a lot of guts to openly share it so that everyone can learn from it. This is one of the reasons SRT was able to have outstanding success in the long run as he had all these values and principles deep rooted in him. I browse through many articles and posts on a daily basis. If I find something truly outstanding I print them, irrespective of how many pages are involved. Yes, sure; you can save it and access it later. Personally for me converting the ideas into a document I can hold, highlight and saving it separately is compelling. It means I really find that post worthwhile and the value I get from re-reading it is priceless. When was the last time you read something so great that you feel the urge to print it? Not all our written communications need to be “have to print” quality, but if nothing we write urges our readers to print it, we’re not definitely up to the mark. That is one way of checking if we are articulating it correctly so that the readers feel compelled to print them. Print worthy is a good goal we all can strive for. I am thankful for the train ride to work every day. It gives me a chance to read, observe, contemplate and capture ideas that will be relevant to my audience and useful in my speaking, writing, coaching and consulting. Reading broadly and eclectically develops intellectual bandwidth. If we read only what others are reading, we will likely lack the ingredients for true originality. Thank you all the Teachers! Thanks to all the teachers who have made this world a better place to live in. My salutation to you all! We cannot thank you enough for what you have done and what you continue to do.